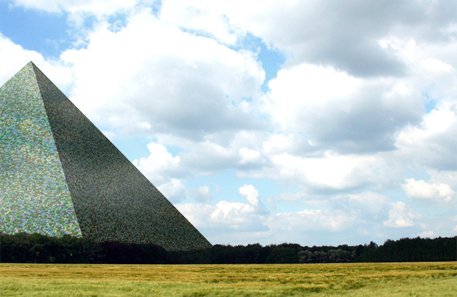 The Great Pyramid can potentially be any human being’s grave or memorial site. As monumental as it is affordable, it serves those of all nationalities and religions. Individuals who are either unwilling or unable to have their ashes buried there can also opt to have a memorial stone placed instead. Stones can be custom designed with any number of colors, images, or relief decorations. The Great Pyramid will continue to grow with every stone placed, eventually forming the largest structure in the history of man. The Egyptian pyramids were built for eternity but only for one single person. This pyramid is open to every individual. Rather than hastily burying one another or allowing our ashes to be scattered, as a small stone in the pyramid we can remain part of our species’ constantly shifting and ever-expanding tableau.